Bassin Zim Waterfall is a fantastic must-see waterfall in Hinche, Centre Department, Haiti, and a wonderful place to visit on your next vacation to Haiti. 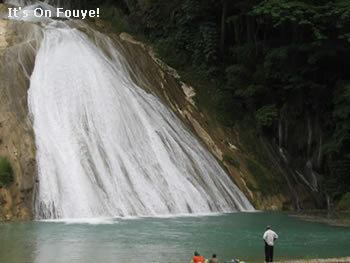 The Bassin Zim water fall is located about 30 minutes outside city of Hinche, Haiti, in a locality called 'Nan Papaye'. Bassin Zim is one of the hidden treasures of Haiti that has never really been explored. I say that because, as magnificent as the Bassin Zim waterfall is, it is not getting the volume of tourist it deserves. Bassin Zim is not just a water fall There is astounding cave that sits right above the water fall. The river that becomes this beautiful waterfall comes shooting out of a whole in the mountain top above, behind the Bassin Zim cave. The water then goes through three natural pools, one right beneath the other, before finally creating this magnificent water fall you will see the next time you vacation there. Je crois que le gouvernement haitien devra formenter le tourisme partout afin que le monde nous connaisse non pas de la polarisation du vodou sinon des lieux fantastiques que nous avons sur notre territoire national.